↑ Spencer، J. R.; Pearl، J. C. (2006). 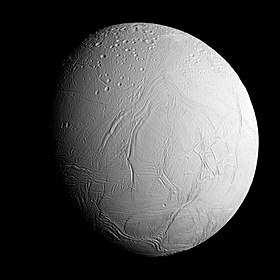 "Cassini Encounters Enceladus: Background and the Discovery of a South Polar Hot Spot". Science 311 (5766): 1401–5. doi:10.1126/science.1121661. PMID 16527965. Bibcode: 2006Sci.۔.311.1401S. ↑ Waite، J. H.; Combi، M. R. (2006). "Cassini Ion and Neutral Mass Spectrometer: Enceladus Plume Composition and Structure". Science 311 (5766): 1419–22. doi:10.1126/science.1121290. PMID 16527970. Bibcode: 2006Sci.۔.311.1419W. ↑ Dougherty، M. K.; Khurana، K. K. (2006). "Identification of a Dynamic Atmosphere at Enceladus with the Cassini Magnetometer". Science 311 (5766): 1406–9. doi:10.1126/science.1120985. PMID 16527966. Bibcode: 2006Sci.۔.311.1406D. ↑ Hansen، Candice J.; Esposito، L. (2006). "Enceladus' Water Vapor Plume". Science 311 (5766): 1422–5. doi:10.1126/science.1121254. PMID 16527971. Bibcode: 2006Sci.۔.311.1422H.